We gave these drops an 80% similarity score. While they smell and taste similar, the Walgreens drop has five additional ingredients in its inactive ingredient panel. They both have the same active ingredient, but we hesitate on consuming something with extra ingredients we struggle to pronounce. 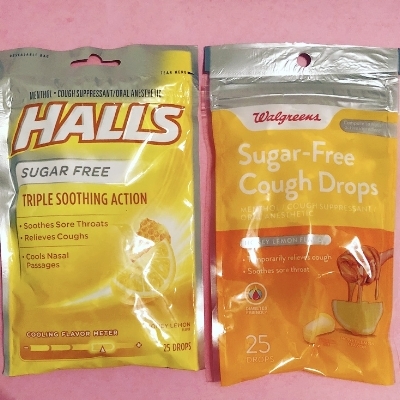 We will keep this one simple, if you want to save money while fighting a cough, the Walgreens honey lemon dupe of the Halls cough drop is not a bad option. While it is lighter in color, the taste is very similar to the Halls cough drop and the active ingredient in both is menthol. Unfortunately, the inactive ingredient panel is only 60% similar because Walgreens has five additional ingredients. We will be sticking to the name brand because we like to consume fewer ingredients, but think you should be aware when you make the decision. Good luck on the end of flu season. Hello allergy season. Where is summer? ?